A nine-line is the standard radio format to evacuate casualties from the battlefield. It is a call for help. When Nick Patterson signed up for the Navy reserves, he just wanted some money for medical school. He never imagined he’d someday find himself fighting for life and limb in the sands of Iraq. Frustrated by a military bureaucracy he cannot begin to understand and an increasingly pointless war, he doubts why he is there and what he is doing. When the plucky and idealistic MEDIVAC pilot Samantha Brown crashes into his life, he sees another side to the war. As their friendship grows into something more serious, Nick is faced with a multitude of choices: Should he stay in the military, or go home to the relaxed atmosphere of private practice? Should he play it safe, or step off into the unknown with the daredevil pilot? As an RN this is well written. The author is a doctor and worked in the middle east. Realistic and a very good story. The narrator is perfect too. Highly recommended realistic romance between a MASH doctor and a female helicopter pilot. . I got this ARC via audiobook boom and this is my voluntary review. This is a story that you must listen to more than one to get the full story. The main characters are doing the best job they can in difficult situations. The story also gives the listener a glimpse into a war that has been misunderstood by many. It also shows how the people in power don't always know what they are doing and they put so many in harm's way because of their egos. This was a good story to help me understand what the men and women who fight for our freedom must endure. They not only have to fight the enemy but sometimes they have to fight the very people in charge of keeping them safe. 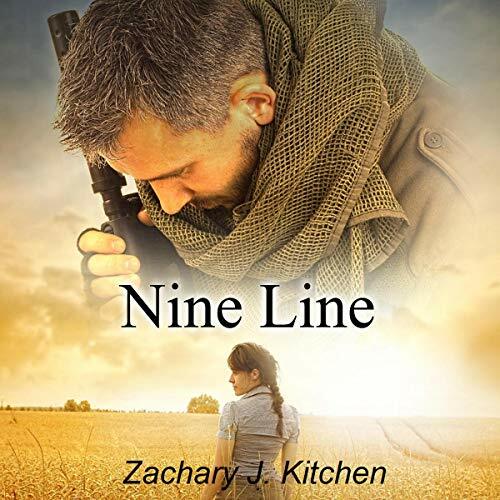 Nine Line by Zachary J Kitchen is a great story. I loved the imagery in this book, along with the unexpected events and humor. The acronym for NAVY was so fitting to this book too. I loved the symbolism that was incorporated in this story. I thought that Kelli White was amazing bringing the characters to life with her voice. Sam and Nick were great characters that deserved their shot at happiness. I requested this review copy audiobook and have voluntarily written this review. I will definitely listen to more books by this author and narrator. I imagine that most of this is drawn from experience, and it looks like the author has had a heck of an interesting life. I gave the performance and the story both four stars but the book overall five stars--something I've never done before. I think it's because I was genuinely grateful to have found such a good book, one that I was sorry to say good-bye to when I reached the end (which for the record, was a bit too abrupt). The blurb next to the title doesn't really summarize the story well in that it presents the book primarily as a romance with the characters' main choices being whether or not to follow their romantic interests. I found the book to be more an honest account of what it means to be at war during a period when one's country has forgotten the military. Nick and Sam are the two main characters, but they spend far more of the story apart than together, and neither one makes decisions incumbent on the other. Instead, they are both doing all they can to do their respective jobs honorably and well in the midst of bureaucratic idiocy, harsh conditions, and conflicting pulls on their loyalty. The author allows us to know Nick a little more personally, and his depictions of the medical horrors that arise during our current military involvements are heart-wrenching and graphic. Sam is a dedicated and professional Marine to her core, and although her love for Nick and the Iraqi boy she takes responsibility for triumph in the end, we understand her personal motivations a bit less. The narration was well-done, and I subtracted one star only because of a few odd pronunciations of American words. I received a copy at my request of this audiobook from the publisher, and I'm very grateful to have had the chance to listen. As another reviewer noted, this story will stick with me for a while, and I will probably look for more by the author in the future. The story is one that burrows into your soul and takes up residence there. Asa one who works with PTSD patients it's a very heartwarming and at the same time heart-wrenching story. Kelli does a good job of bringing the world to life and keeping you engrossed in the audio. I was given a copy of this audio in return for an unbiased review. It took me a little while to get swept in to the story. To be completely honest, it was having it told by a woman when it was all men and war in the beginning. But don’t take that wrong because Kelli White did an outstanding job. Geez, even differentiating accents and tones. But I usually prefer male narrators and this book is almost entirely Nick’s point of view. Some of the story was easily predictable but not he tragedies they all experienced from war. I learned a lot about military procedure. Scenes are given a lot of depth and it was easy to visualize what people and their surroundings looked like. Characters’ personalities were developed so well that tragedies hurt and triumphs elated. Not to give anything away but I wish I could have spent more time with a certain mouthy doctor... but anyway, there was a satifying HEA. I received a green copy of this book in exchange for my honest review. I will admit that war centric stories are not my usual. But this one grabbed me and held on. Nick is a doctor at an aid station during the second Iraq war. He and his tight knit group of other doctors and medics save the lives of wounded soldiers every day. Through it all, his marriage at home is falling apart. He meets Sam (Samantha) who is a helicopter pilot. She grabs his attention in the few minutes he is in her presence. Then, she is gone, but she sticks in his mind. While out on patrol, Nick picks up an Iraqi kid, whom his team named Manny. The team adopts him and takes care of him as best they can. Sam ends up being grounded and comes back to the aid station to assist. She and Nick become friends, but are both too noble due to his marital status to do anything else. This is war and one attack later, Nick is wounded and goes back to the states. He cannot cope though and asks to come back to the Navy. This time he ends up in Afghanistan and Sam is right there as well. They go on a mission that nearly ends them all. By this time Nick is just about divorced. I am not doing this book justice. The reality of war is so much more heartbreaking and it brings the people involved into very tight teams of more than family. The fact that Nick and Samantha were able to rise up from these ashes makes me appreciate exactly how much our veterans go through while deployed and what it takes to come back to civilian life. War is hell. Nine Line takes you into the depths and soul of the war zone. You feel the power and depth of war. Zachary J. Kitchen brings you through the anguish and death. Such an emotional and beautiful story. Ms White’s narration was full of emotion. I received this audible in exchange for my honest review.